Forbes has recognized Tannenbaum Helpern Syracuse & Hirschtritt LLP as a top US law firm. Since our founding in 1978, our firm has always put a great emphasis on providing quality legal counsel to the business community. We are proud to announce that Forbes, an authoritative global news source, has recognized Tannenbaum Helpern Syracuse & Hirschtritt LLP as a top US law firm. 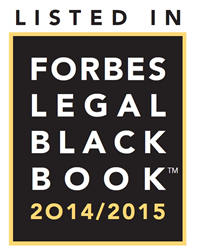 Forbes 2014-2015 Legal Black Book list, created by Forbes Business Division, recognizes a select group of elite law firms, regardless of size, for providing critical legal services to US and global corporations. Selection is based on a law firm’s track record of providing quality legal counsel to corporations, practice area range and focus, and high ranking for quality execution in multiple reviews.